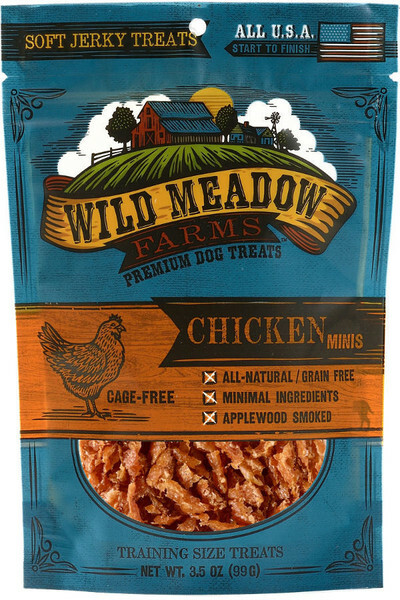 Wild Meadow Farms makes some great dog treats, and their minis are a fantastic option for training treats, or just for small dogs. They're the perfect size to reward your pet without giving them too many calories per treat. They even come in five flavors: cage-free chicken, cage-free duck, cage-free turkey, grass-fed beef, and free-range bison, so you're bound to find one your dog will like. Additionally, they make the larger "bites" style in all the same flavors in case you have a larger dog, for whom the minis might be a bit too small, or in case you want to provide a larger reward. They also make strips of chicken jerky for a longer-lasting, but still tasty, reward. All of their treats are made solely out of meat, vegetable glycerin (as a binder), and potassium sorbate (as a preservative), making it an incredibly limited ingredient treat. It's a great choice for dogs who have allergies or who particularly enjoy one particular flavor of meat. You can find these treats on our website at https://www.bernalbeast.com/SearchResults.asp?Search=wild+meadow&Submit=, and if you order $49 or more of them, you'll get free shipping on the order!